Photo evidence shows Gaza-bound deadly mortars and other weapons intercepted by the Navy. On board: advanced radar for land-to-sea missiles. 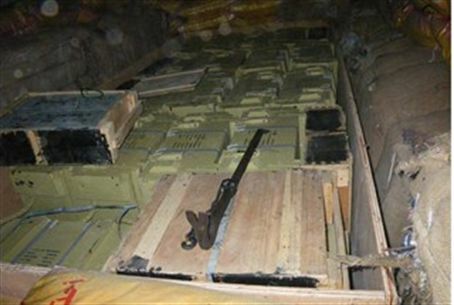 The government has released photo evidence of deadly mortars and advanced weapons, shipped from Iran and intercepted by the Navy before they could reach Gaza via a boat that sailed from a Syrian port. Among the weapons, some of them made in China, were advanced land-to-sea missiles designed to help Hamas sink Israeli navy patrol boats. The commando unit “13,” the same company that confronted the IHH terrorist Mavi Marmara ship last May 31, boarded the Victory ship Tuesday, located the illegal weapons and escorted the ship to the port of Ashdod. According to the ship's document, and the account of the crew, the ship initially departed from Latakia port in Syria, and then proceeded to the Port of Mersin in Turkey before sailing towards its destination in Egypt, from which the weapons were to be smuggled through tunnels to Gaza. The freight manifest of the Victoria camouflaged the true nature of the content of the ship's containers, in violation of the relevant provisions of the International Maritime Organization's Conventions and professional standards, the government added.